And leading us astray with dreams of youth. Reveals to us when your decay set in. So now the light you cast seems somehow faint and dim. 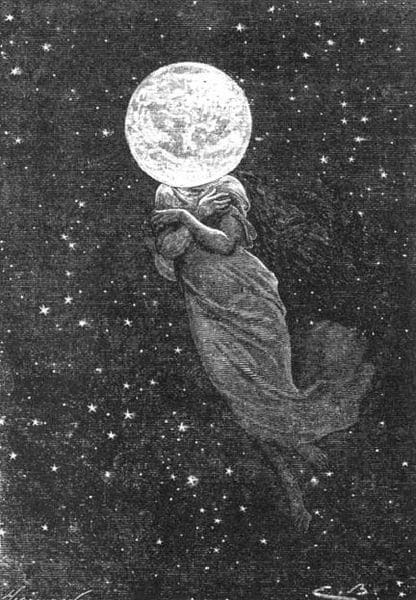 An illustration from Jules Verne’s novel “Around the Moon” drawn by Émile-Antoine Bayard and Alphonse de Neuville. This is a Spenserian stanza, inspired by recent research that has discovered the moon is at least 4.51 billion years old, which is 40 – 140 million years older than was previously thought. By examining zircons (a type of mineral, whose colourless varieties are often used as affordable alternatives to diamonds in jewellery) found in moon rocks brought back to Earth by astronauts on the Apollo 14 mission (who landed on the moon in 1971), researchers identified a minimum age for the moon. It is believed that the moon was formed by a violent, head-on collision between the early Earth and a “planetary embryo” called Theia in an event known as the ‘Giant Impact.’ Since the Giant Impact the moon has experienced many other smaller collisions, and because of this it is usually difficult to determine the age of moon rocks, as most of them contain a variety of different fragments from the colliding objects. Previous investigations have therefore identified the age of some of these collision events, rather than the age of the moon’s formation. However, by examining pristine zircons that were uncontaminated from other sources (and which were created during the Giant Impact), the researchers in this study could determine the age of the moon. One of the ways that they could date the zircon was by measuring the rate at which the uranium contained within them had decayed into lead. The researchers concluded that the formation of the Earth-Moon system must have occurred within the first 60 million years of the formation of our solar system. Cleverly composed poem. Had me thinking along parallel lines to begin with. Thanks for the clear explanation. Wow that is beautiful. Your intriguing poem made me keen to read the explanation and the image you chose is so apt and hints at antiquity. Go Zircons! For future visitors from earth. In children’s dreams, and lores of our race. …And gently nudged us when to wake or rest. My thought process with the title was to invoke the notion that zircons are seen as ‘fake diamonds’ but that really they can be quite beautiful. It was not a comment on the moon itself, for which you beautifully describe my own feelings. Perhaps “Fake Diamonds in the Sky” would have been better?